Although this development is intended to benefit QuickBooks + Salesforce users, the transition can seem daunting for many small businesses. If you are a Salesforce for QuickBooks subscriber, your salesforce.com and the included integration services will cease. If you are a Salesforce for QuickBooks Integration subscriber, only your integration services will cease and your account will be cancelled. Your Salesforce CRM service will not be affected by the change to your integration service. Orders will not flow directly from Salesforce to QuickBooks. QuickBooks will not automatically create new accounts or invoices – affecting your billing going forward. Day-to-Day bookkeeping and accounting will be negatively affected in general. Intuit is canceling the CRM subscription in addition to the integration app. Therefore businesses that are using the CRM through a QuickBooks subscription will need to transfer that subscription over to salesforce.com. Once you have transferred your CRM subscription, you now need to implement an integration between Salesforce and QuickBooks. With the discontinuation of the integration app, 3rd party applications are the only option. In the meantime, processes that were previously automated must now be executed manually. We suggest that small businesses move very quickly to create a new integration between Salesforce + QuickBooks. The longer it takes to implement a new integration, the more work will have to be done manually. 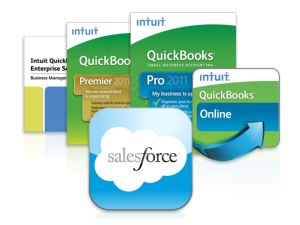 Salesforce + QuickBooks integration is one of the most common requests we’ve received over the years. We’ve helped clients develop integration strategies and implement 3rd party integrations as well as set up Salesforce for Quickbooks. So if you are concerned about how this development could affect your business, please do not hesitate to reach out. We’re more than happy to discuss the ramifications to your business as well as your best options moving forward.